When I purchased my box of 2017 Leaf Metal Draft Football from Atlanta Sports Cards, I received (4) 2017 Leaf Holiday Bonus Packs. According to Leaf’s CEO Brian Gray, these were given to distributors based on 2017 purchases. Inside each pack is an autograph, relic, or printing plate from a wide range of Leaf products. The folks over at TeenyMates have seen great success with their packaged tin products. Two years ago, they released their first tin that contained NFL wide receivers. It was produced in small quantities, and the price shot through the roof. Today that tin can still be found for about $50 sealed. They’ve calmed down a bit. At one time they were selling close to $100. Licensing is key when it comes to these little guys. TeenyMates tried their own line of figures called TeenyFreaks. But I don’t think they got the response from collectors like they had hoped, because we never saw them again. One of their newest fully licensed products deals with the WWE. The WWE Series 1 tin comes with (4) packs of figures, display stand, and an exclusive Glow-in-the-Dark Macho Man figure. Series 1 consists of (28) figures, plus (4) rare ones – Glow-in-the-Dark Undertaker (1:64 packs), Crystal Clear John Cena (1:128 packs), Alternate Macho Man (1:256 packs), and The Rock Metallic Gold (1:512 packs). Judging by completed sales, the Alternate Macho Man figure seems to be the most popular. Outside of their TeenyFreaks line, this is the only other set where each figure has to look different. When it comes to MLB, NFL, NBA, or NHL the teams change, but the figures are basically the same. Down the line it would be cool to see some individualized TeenyMates figures for other sports. That probably would involve the Players Association approval though. Professional wrestlers also have very distinct facial features which can easily be incorporated into such a tiny figure. Other athletes might be more difficult to bring to life in such a small form since their uniforms and faces look similar. Party Animal Toys makes all kinds of neat sports related stuff. When I first heard of them, they were only making Lil’ Teammates figures. In addition to Lil’ Teammates figures, now they make TeenyMates, Lil’ Troops, and a new product called Mad Lids. Mad Lids are exactly what they look like – tiny collectible hats. Right now they’re only available for NFL teams, but I have a feeling it won’t be long until we see them cross over into other sports. The hats themselves are down right exact miniature versions of the real thing. You’ll even notice they include the New Era logo on the side. If you look closely, you can even see small bumps on the hats to give them that authentic feel. Unlike their other toys, Mad Lids do require some assembly. The base, stand, and hat all need to be snapped together. I found this to be quite simple. The base contains a hexagon shaped hole in which the round stand gets placed into. On the base, there is a blank area for a team sticker. This seemed to be the most difficult part for me. Getting those stickers on straight can be hard. 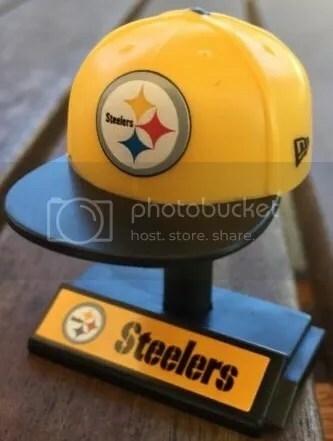 In addition to all (32) NFL teams, they’ve included (4) rare lids to keep an eye out for – Glow-In-The-Dark (1:64 packs), NFL Line Judge Cap (1:124 packs), Camouflage Cap (1:190 packs), and Metallic Gold (1:400 packs). Chase pieces like this have been known to command serious money on the secondary market. Got my hands on a couple packs of the new MLB TeenyMates. Below is what I pulled. These little guys are awesome!